Want to show everyone who your favorite Pokemon is and you don’t know how? Why not try out these ear studs! Handmade by polymer clay, these cute ear studs are available in the Eeveelutions, Legndaries and all the Pokeballs! Should you choose Flareon, Vaporeon, or Jolteon? One of the toughest decisions you’ll ever make in a Pokemon game! These Evolution Stone replicas commemorate the struggles of hard choices and makes a cool gift idea for any collector. It’s dangerous to toe alone, take this! These Legend of Zelda ankle socks come in a pack of 5 and are just the thing you need for when you’re out gathering artifacts and fighting evil monsters. Show your Zelda pride or hide it – your choice! You’ll feel invincible in the tub with this Super Star bath bomb! The perfect gift for anyone who has a passion for video games, baths, and nostalgia who’s in need of some relaxation. Just fill up the tub, pop one in, and watch the bath bomb do it’s thing. Decorate your laptop or sketchbook with some retro video game style! 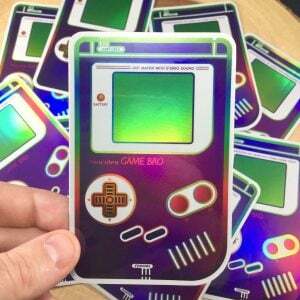 This wicked holographic sticker features a digital illustration of the classic Gameboy. A rainbow of colors appear when light is reflected off this awesome decal. The most cuddly way to catch them all! These soft and squishable pokeballs are the perfect addition to any desk or bedroom. All hand crocheted and filled with soft stuffing to not harm any Pokemon or people you may try to catch. Revisit Mario’s best moments as he travels across the kingdoms with his sidekick, Cappy! 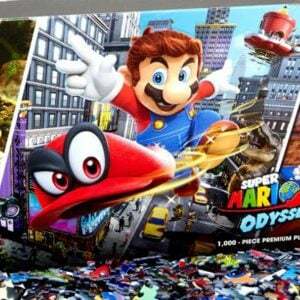 Complete this jigsaw puzzle to create snapshots of Mario and Cappy in the hit Nintendo Switch game, Super Mario Odyssey. Select your weapon and increase accuracy cutting veggies and meat! If you like using a kitchen knife as much as Link’s Master Sword, then this quality made NES cartridge cutting board is the perfect kitchen accessory for you. These Question Blocks are no ordinary cushions, each one contains a great hidden surprise inside! Everyone knows that these floating blocks each contain hidden gems, and in this one you get a blanket with a Super Mushroom design. It’s dangerous to go alone! Here, don’t forget to take your keys! Never get locked out alone in the treacherous and scary lost woods again with this handy reminder to grab your keys before you leave the house. Zoom zoom around the party with this costume inspired by the epic racing game, Mario Kart. Available in either Mario or Luigi, the kart is made from soft foam, so any crashes shouldn’t result in too much injury. Blue shells and bananas not included. Share yummy treats with friends and family in the form of delicious Splatoon characters. With these cookie cutters you’ll be able to provide smiles while satisfying sugar cravings as they indulge in your next batch of cookies.